PUPCET for A.Y. 2018-2019 Schedule, Requirements, Online Application and Exam Dates - Balita Boss! Polytechnic University of the Philippines College Entrance Examination (PUPCET) of Sta. Mesa Branch for academic year 2018-2019 schedule is out. While other branch and campuses have not yet announced the schedule of their branch’s PUPCET, the said tertiary entrance test on PUP main campus will take place on October 14, 2017 (Saturday). An Alternative Learning System Accreditation & Equivalency (ALS A & E) Test for Secondary Level passer, eligible for admission to college and has 100 or higher Standard Score (SS) with Essay Writing of 2 or higher. 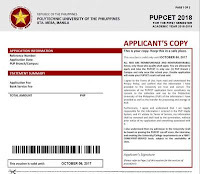 All PUPCET applicants must apply online through PUP iApply (https://www.pup.edu.ph/iapply/) and is only allowed to take and apply the examination in only one (1) campus once in an academic year. Applicant’s PUPCET result will be null and void if multiple applications are done by only one applicant. 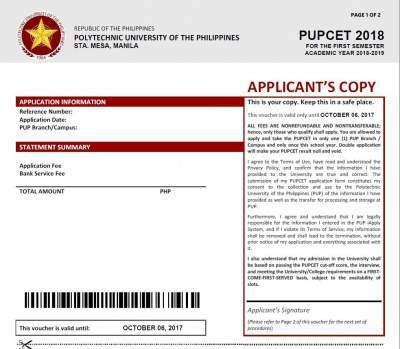 Through a PUP Branch/Campus Cashier, where applicant could proceed immediately to PUP Branch/Campus Admission Services to tag his/her payment. Note: PUPCET fee is non-refundable and non-transferrable and ¹ only selected PUP Branch/Campus accepts onsite payment.